Courtesy Photo Members of the local Big Walnut Joint Fire District were among hundreds of fellow firefighters who completed the Ohio Oil and Gas Energy Education Program’s (OOGEEP) oilfield emergency response training program. Multiple training sessions are held each year at a dedicated training center located within the Wayne County Regional Fire and Rescue Training Facility. Granville, OH – Firefighters from the Morrow County area recently completed the Ohio Oil and Gas Energy Education Program’s (OOGEEP) oilfield emergency response training program. The training educates first responders how to effectively manage and address potential and rare oilfield incidents. 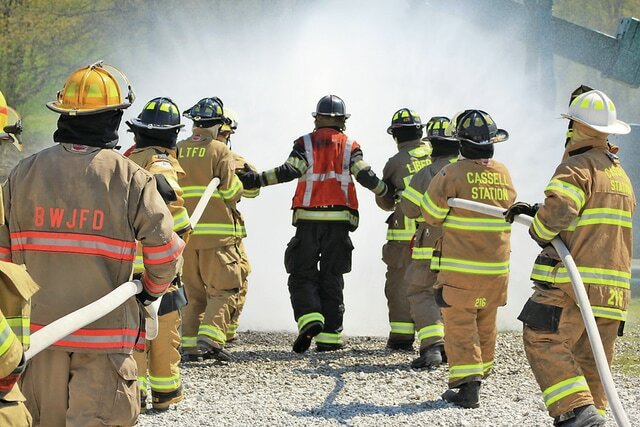 First responders from the Big Walnut Joint Fire District now join more than 1,300 firefighters who have attended OOGEEP’s workshops, funded completely by Ohio’s oil and gas producers. Now in its 14th year, the program was the first of its kind in the country. The accredited and certified workshops are two-day sessions that include classroom instruction and field demonstrations. First responders learn: basic information regarding Ohio oil and gas activity and development; differences between emergencies and non-emergencies or common oilfield practices; common terminology and types of equipment used during oilfield activity; and hands-on techniques for responding to potential incidents, including live demonstrations. The training curriculum was collaboratively developed by OOGEEP, the oil and gas industry, regulatory agencies, firefighters and emergency response experts and meets state and federal fire safety standards. The program is endorsed by the Ohio Fire Chief’s Association, Ohio Society of Fire Service Instructors and Ohio Fire and Emergency Services Foundation. OOGEEP holds multiple training sessions each year at a dedicated training center located within the Wayne County Regional Fire and Rescue Training Facility.